CRES Land Trust is coordinating with land management partners to eradicate Japanese stiltgrass, a non-native invasive plant common to southern Indiana and the eastern United States and newly identified in northern Indiana late last fall. In January, the local nonprofit temporarily closed its Little Cedar Creek Wildlife Sanctuary to prevent the spread of the invasion throughout the region. Photo: Rob Biggs, Allen County Highway Department Foreman and Casey Jones, ACRES director of land management coordinate fight against Japanese stiltgrass. Japanese stiltgrass can crowd out native plants, reducing tree regeneration and slowing the growth of tree seedlings and existing plants, creating a monoculture. It is an annual, spread by seed. Japanese stiltgrass thrives in a variety of soil and light conditions. Earlier this spring, the nonprofit saw success spraying large patches of the invasion with a grass-specific herbicide. Little Cedar Creek, which borders the preserve and the 100-acre area where the species has invaded, is a tributary of Cedar Creek. Cedar Creek is one of three rivers in the state designated under the 1973 Indiana Natural, Scenic and Recreational Rivers Act. Local partners in treating the outbreak and monitoring natural areas for the plant include The Nature Conservancy, Indiana DNR Division of Nature Preserves, Allen County Highway Department, Fort Wayne Parks, Fort Wayne Trails, and Little River Wetlands Project. 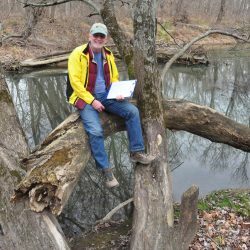 The Indiana Native Plant and Wildflower Society (INPAWS) and the Olive B. Cole Foundation are funding partners. Jones and ACRES’ land management interns will spend at least 560 hours through October 2016 on the stiltgrass project. A private contractor will help ACRES assess the impact Japanese stiltgrass has on local flora. ACRES has identified Japanese stiltgrass, pictured left (photo courtesy The Nature Conservancy), on other preserves in small patches, away from trails where the invasive does not pose as great of a threat of spreading by foot traffic — from seeds sticking in boot treads. These preserves will remain open to visitors, who must stay on the trails and keep dogs on leash to keep the seeds from invading other natural areas and their own property. May to October, Japanese stiltgrass is identified by its broad, bright green leaves with a faint luminescent line down the mid-section, forming a shallow ‘v’ as they extend from the stem. If you see a suspected infestation take a picture of the grass and report it on-line through Report IN, an invasive plant reporting system at EDDMapS.org/Indiana. 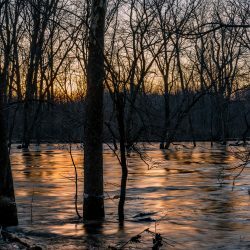 Together with its members, ACRES Land Trust protects 5,924 acres of wetlands, forests, native grasslands and working lands in northeast Indiana, northwest Ohio and southern Michigan. 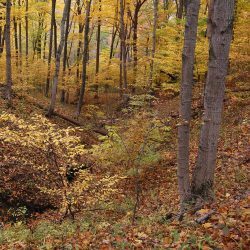 ACRES provides more than 70 miles of trails through nature preserves for hiking, photography, birding, wellness, family and school visits, reflection, discovery and adventure.